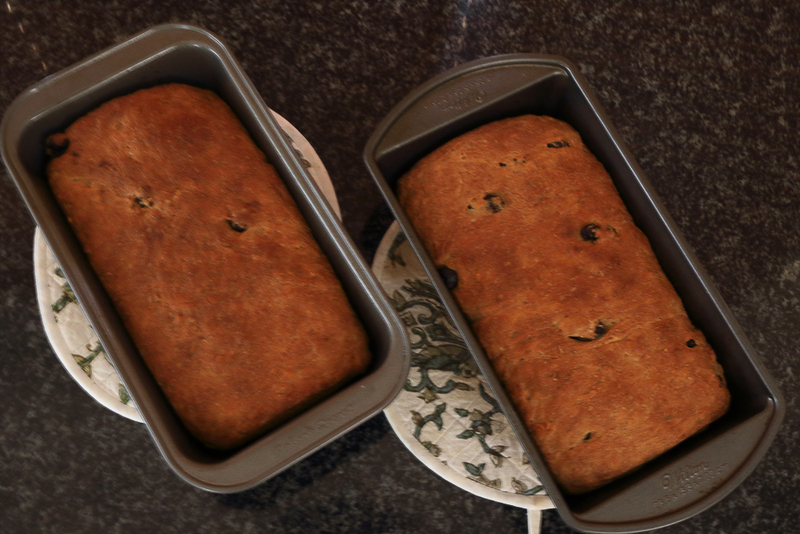 It has been a month now of baking my own bread and it’s time for a healthy but festive cinnamon raisin bread No more store-bought stuff if I can help it. This means that I have to get myself organised before the day of the baking. I find that early morning is a good time to start because it allows the dough 2 or 3 unhurried proofings, goes into the oven by late afternoon and by sunset it’s sitting on my kitchen counter, spreading its comforting aroma in my home (Nothing like cinnamon raisin bread to fill the air with cheer). Last week on my bread-baking day, a mirthless wind prowled outside, bringing the chill and gloom of winter lurking around the corner. “What better day to bake bread”, I thought. My home and hearth needed a warm hug. The kind of hug that would make my boys feel fuzzy and loved when they got home at the end of the day. 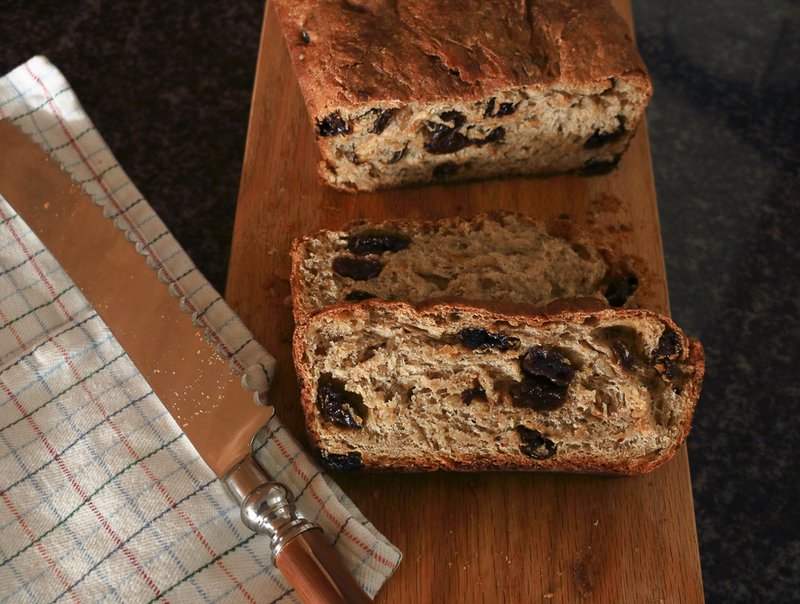 It called for a cinnamon raisin bread, a bold and bright contrast to the cold outside. I had this picture in my head of a dollop of butter gently melting on a slice of cinnamon bread….yum! It is entirely possible that the thought of my home redolent with cinnamony scents was the single biggest motivation behind my choice of bread. This recipe is from Jeffrey Hamelman’s Bread. I have adjusted the quantities and part of the process for what I felt would help me get a better result. Ever since I started seriously experimenting with bread, I have tried to more often than not, use more whole grains, although it’s not possible to completely eliminate plain flour from the process because of its high gluten content that makes perfectly crusty and aerated loaves. This whole wheat loaf has a small percentage of plain flour that helps prevent it from becoming too dense. 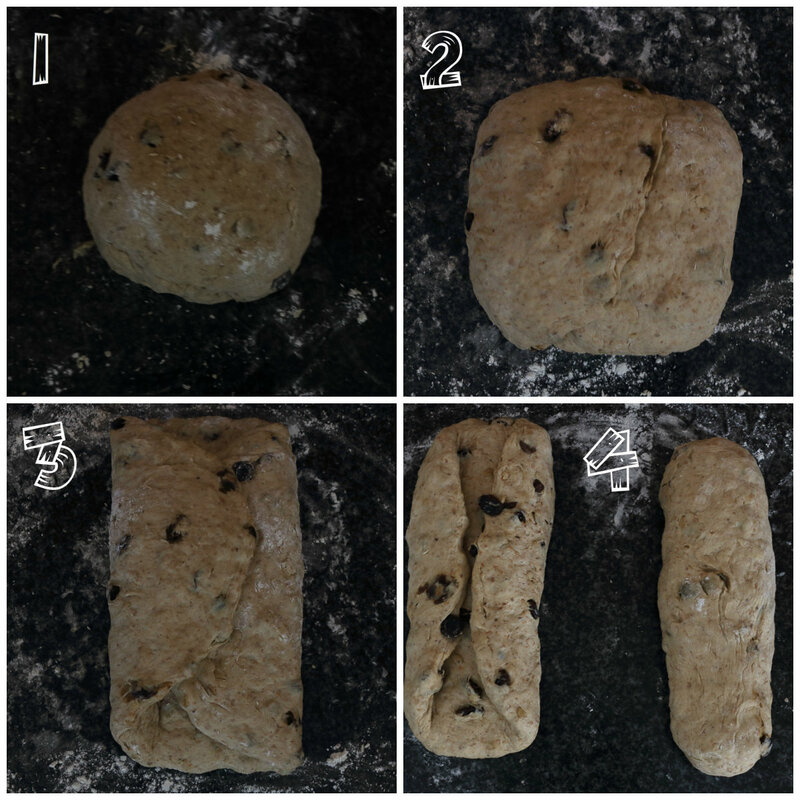 The history, science, technique, myth and secret tips and tricks associated with baking bread can be quite intimidating and it did bring out the procrastinator in me for a while. But the urge to say yes to yeast won and I began this discovery that I’m sure will last a long time. So when I’m not baking, I try to read (and retain) as much as I can about this magical process. And I read somewhere that cinnamon is not a friend to yeast. It can literally knock the wind out of your dough, preventing it from proofing fully and resulting in brick bread. So it’s best to add cinnamon only when the dough has been rested for about 20 minutes after combining with the yeast, so that it hydrates well and the yeast gets a chance to race ahead and get super active before the cinnamon kick in. 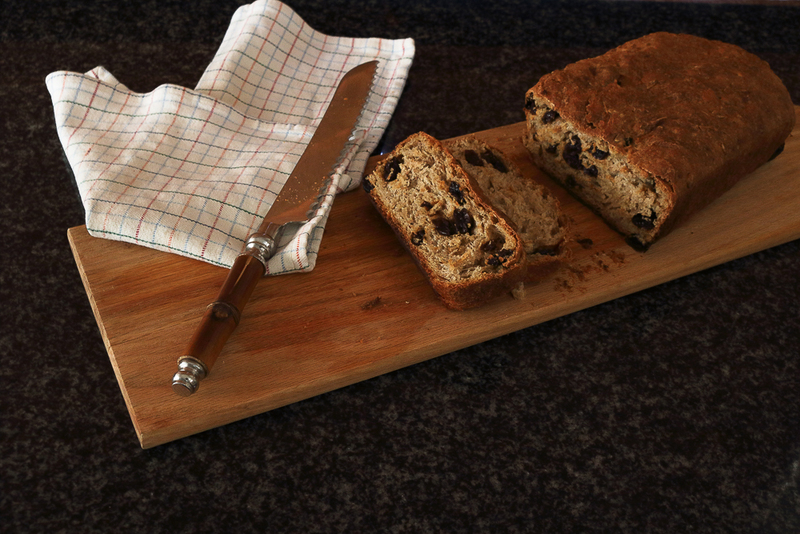 In this recipe, raisins add a nice moistness and together with a small amount of muesli keep it texturally interesting. 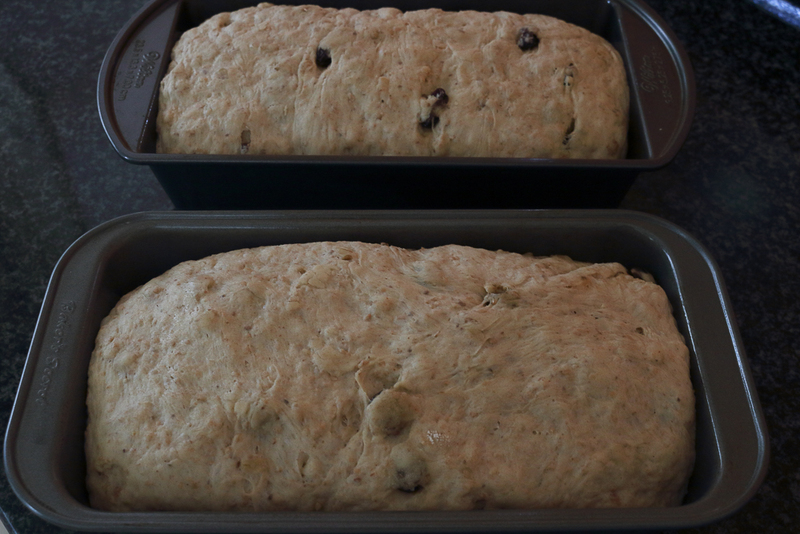 You will notice in the pictures that my cinnamon raisin bread doesn’t have too much height. This could’ve happened because my loaf pans are an inch or so larger than they should’ve been and maybe I should’ve left it out a little longer for the final rise, considering it was a chilly day. But even without the crown, the loaves dotted with pockets of air, were soft and chewy and toasted up beautifully. Leftover cinnamon raisin bread calls for a rich bread pudding and makes a seriously decadent French toast. Warm cinnamon raisin French toast topped with bananas for breakfast on a cold winter morning is nothing short of blissful! And yes, my home smelt like Christmas in April.